Yudhisthira Maharaja said, "0 Lord, You have so nicely explained the glories of the auspicious Saphala Ekadashi which occurs during the dark fortnight of the month of Pausa [December-January]. Now please be merciful to me and explain the Ekadashi of the light fortnight of this month. What is its name, and what Deity should be worshiped on that sacred day? 0 Purusottama, 0 Hrsikesa, please also tell me how You can be pleased on this day." Lord Shri Krishna replied, "0 king, for the benefit of all humanity I shall tell you how to observe fasting on Pausa-sukla Ekadashi. "As I previously explained, everyone should observe the rules and regulations of Ekadashi to the best of his ability. This injunction also applies to the Ekadashi named Putrada, which destroys all sins and elevates one to the spiritual abode. Shri Narayana, the Supreme Lord and original personality, is the worshipable Deity of this Ekadashi, and for His faithful devotee He happily fulfills all desires and awards full perfection. 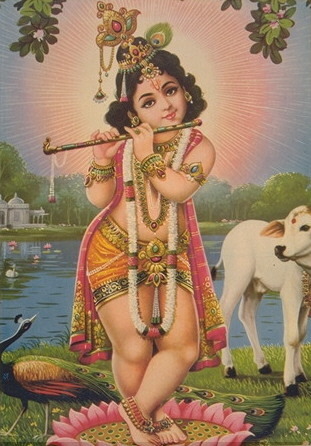 Thus among all the animate and inanimate beings in the three worlds, there is no better personality than Lord Narayana. "0 king, now I will narrate to you the history of Putrada Ekadashi, which removes all kinds of sins and makes one famous and learned.